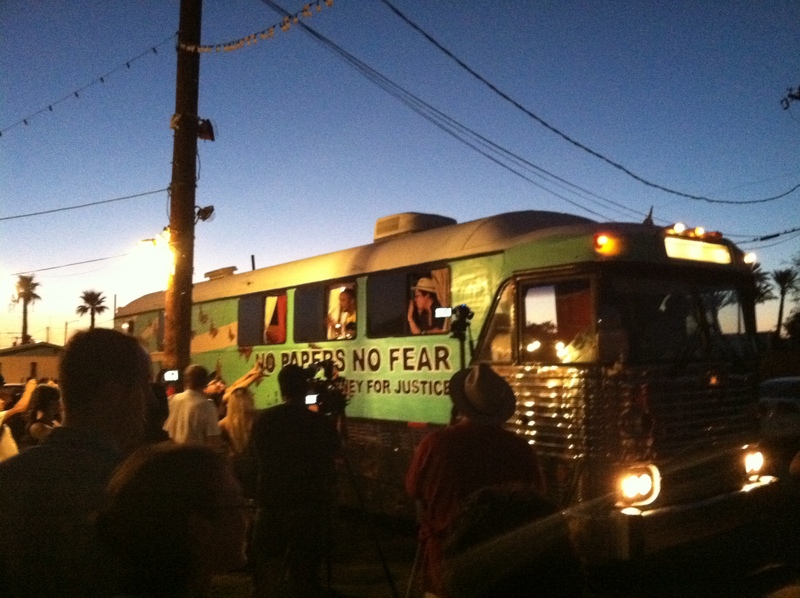 On July 29th, 2012, the Undocubus took off from Phoenix, Arizona with a brave group of undocumented immigrants and allies of all ages. The No Papers, No Fear: Ride For Justice is headed east to the Democratic National Convention taking place in Charlotte, North Carolina September 3-7, 2012. 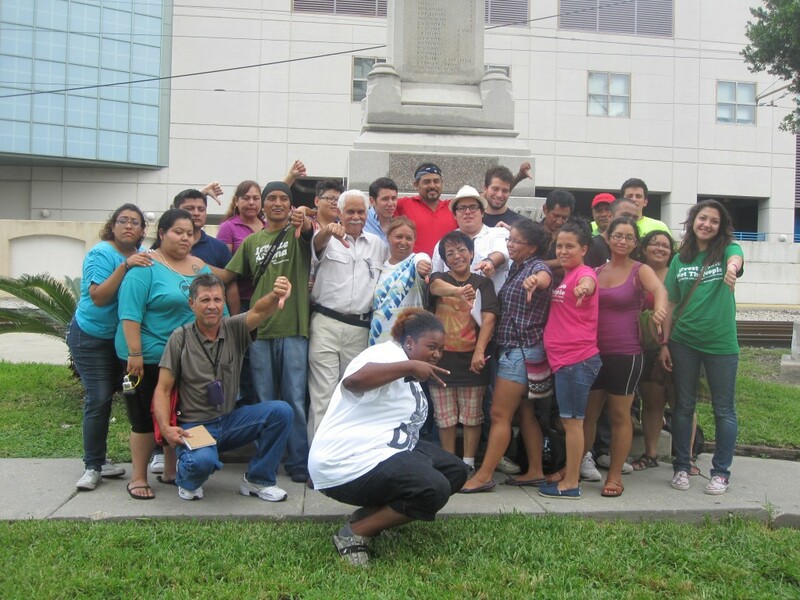 Tired of living in fear, 30 riders are traveling the South to in order bring to the national spotlight their stories which highlight the problems with our immigration policies, the destructive marriage of local police and immigration enforcement officials, and the reality that ‘the only secure community is an organized one’. For years now, undocumented youth, often referred to as DREAMers have been “coming out of the shadows” and organizing acts of civil disobedience to highlight their stories and demand the passing of the DREAM act which would legalize their immigration status. Falling short of their demand for an executive order to stop the deportation of DREAM Act eligible youth, their “Undoccupations” of Obama for America offices across the country in June did prompt a differed action policy allowing DREAMers work permits and drivers licenses for the next two years. This was not enough. DREAMers have parents, they have aunts, uncles, and neighbors who are also being terrorized by draconian policies like Arizona’s SB1070 being implemented in their states. In the cases of Georgia and Alabama, the effects are even more detrimental. During his time in office, Obama has deported over one million people. The separation of families and unjust detention and deportation of workers, mothers, fathers, students, and day-laborers is unacceptable. The politics of exclusion must be transformed into a politics of inclusion. One in which every human being is treated with respect and dignity. Undoubtedly the best example of the devastating effects of the police/immigration marriage, the “Poli-Migra” is Maricopa County’s Sheriff Joe Arpaio in Arizona. His discriminatory policies have finally prompted a series of federal investigations and lawsuits. The week before the Undocubus took off, four of the riders participated in and act of civil disobedience outside of his trial in Phoenix as they shouted out to him that they were “undocumented and unafraid”. On July 24, 2012 all four were arrested and had Immigration and Customs Enforcement (ICE) holds placed on them. This is a mandated practice among police departments who cooperate with ICE. One of the arrestees, Miguel Guerra, was actually transferred to an ICE processing center after his arrest. Thanks to community pressure, all were released and had their ICE holds removed, therefore they were not placed into deportation proceedings. The sad reality, however, is that people like them get arrested everyday for driving their children to school, going to and from work, or at periodic checkpoints and they do not face the same fate. Most are sent to detention centers for months, sometimes years, and persuaded to sign their own voluntary deportation orders. Like the DREAMers, it was the fact that they had a large base of community support behind them which allowed them to stay with their families. Tired of living in constant fear, harassment, and racial profiling by Arpaio and as undocumented people, they have been organizing their communities to take action. “I know in my heart that something has to change and that undocumented people like myself are going to be the ones to do it,” said Leticia Ramirez, who was also arrested that day and is a rider on the Undocubus. The Arizona organizers were joined by riders from Illinois, California, Georgia, Tennessee, New Jersey, Michigan, and Washington, D.C. Together they’ve been hosting educational exchange workshops in which they share their collective experiences and organizing skills with the communities they have visited along the way. Host communities are learning about the riders’ struggles and their message while the riders are learning more about the local struggles the host communities are a part of. They are calling on people who support their struggle to show up at the DNC in September to confront the President.